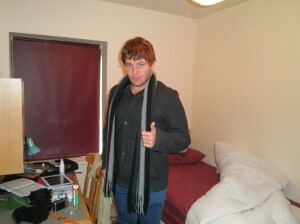 Hey everyone this is my first blog post after 5 days in Ireland. I’m studying at UCD in Dublin and just started classes today. We arrived on Wednesday at about 11am after a long plane trip. The first thing you notice about Dublin is it is bloody cold! Being a used to 30 degree heat in Brisbane, the weather here was a bit of a shock. It’s quite a nice change from sweating in Brisbane though. 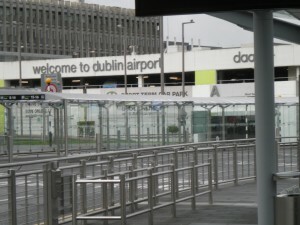 From the airport we got the Aircoach to UCD which was 8 Euros each, where as a taxi would be 50-60 euros we were told. The coach takes about 45 mins from the Airport and drops you right outside. From there we had to lug our bags across campus which was pretty tiring but we made it. We are staying on campus at the Belgrove residence. It is the cheapest residence you can stay at 2400 Euros for the semester and is fairly basic. But we’ve been told by the Irish people we’ve met that it has the best craic (fun in Irish), so I’d recommend it if you don’t mind living a bit simpler and having a few parties ;). Above is what a room looks like. This is Josh who is on exchange from QUT as well so he’ll be featuring in the blog a bit haha. He looks suitably impressed. The cost of living here is quite good and i’d say probably a little bit cheaper than Brisbane, especially with the strength of the Aussie dollar against the Euro. Dinner in a pub is about 10 euro, a pint about 4 euro and bus 1.90. A cab home from the city is about 12 euros which is fairly good if you have 4 in the cab. The campus is about 15 mins on the bus from the city centre, with a bus stop on campus, so it is not too hard to get around. Finally I had my first class today so i’ll finish on that. It was Economics of Public Policy, with about 50 people in the class. The classes here are a bit different to Brisbane. You take 6 subjects instead of 4 and there are more lectures but not many tutes. For example today’s lecture only went for 45 minutes and we have another one on Wednesday but no tutorials…kind of makes you wonder why they don’t just knock it over in one 2 hour session. My first impression is that it seems a bit easier than QUT and more focus on self study rather than lots of contact hours.